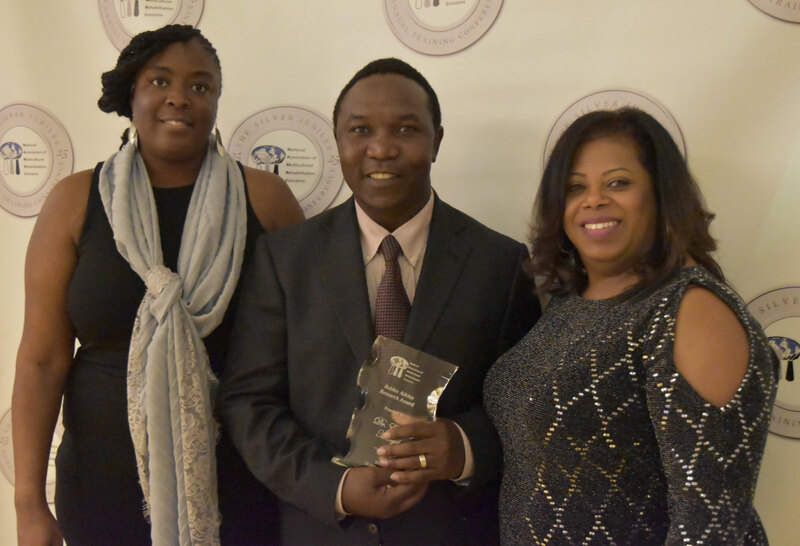 Langston, Okla. - Dr. Edward O. Manyibe, Research Associate Professor and Capacity Building Director of the Rehabilitation Research and Training Center (RRTC) received the 2018 Bobbie Atkins Research Award from the National Association of Multicultural Rehabilitation Concerns (NAMRC) on July 13, 2018. Dr. Manyibe was honored for his production of a significant volume of exemplary research and associated publications, research related to multiculturalism and disability, and development of research which has or will make a difference in thinking and/or practice in the multicultural arena. It was the research and publication of Bobbie Atkins, the person after which the award was named, that provided the impetus for increased awareness surrounding the special issues impacting persons of color with disabilities. Her landmark research, “Vocational Rehabilitation of Blacks: The Statement,” published in the Journal of Rehabilitation in 1980, disclosed the inherent inequities for blacks served by the public vocational rehabilitation system. Since her publication, Dr. Atkins has been a leading educator, publisher, researcher and trainer, grant developer, and spokesperson on multicultural, gender and other issues in rehabilitation. The NAMRC is a diverse group whose purpose is to advocate for the rehabilitation needs of multicultural persons with disabilities. The NAMRC promotes and advocates a greater understanding of the needs of multicultural populations with disabilities, and assists multicultural populations to become self-sufficient and reach their highest level of attainment in society. Langston University (LU) is a public Historically Black University enrolling a close-knit community of under 3,000 students. Langston University is recognized as a top institution of higher learning for affordability by afforableschools.net and bestvalueschools.com. Founded in 1897, LU is located in rural Logan County and has urban campuses in Oklahoma City and Tulsa. Langston offers more than 40 associate, bachelors, masters, and doctoral programs across six academic colleges. Visit us online at http://www.langston.edu.